Traveling for Mozilla is a humbling experience. It’s easy sometimes to look at the rise of Firefox as a market phenomenon, as a set of amazing numbers, as a set of graphs all trending up and to the right. And that’s true enough, of course — but the eye-popping numbers — the maybe 150,000,000 (we hit 50M daily users a couple of weeks ago, which roughly equates to 150M active) people around the world who use the technology — they’re gaudy enough that sometimes they obscure the more important story. The story’s simple — it started 10 years ago in a way that not many people knew how to interpret at the time or since — but it’s always been a story of individuals deciding that the world can, and should, be better, and that the best way to make that happen is to jump in and get started. That the best way to get a menu to look a certain way is to start writing code. That the best way to get a browser in a certain language is start translating strings. That the best way to help people understand the importance of the Internet is to start talking to everyone. This trip, and every trip I’ve taken for Mozilla — 3 to Europe, 5 to Japan, and 3 to China so far — has been an object lesson in this theme. I got to spend time with Tristan and Peter, who decided some years ago that Mozilla in Europe was important enough to start with uncertain prospects — they’re amazing in their dedication and results. And with Pascal, who is so generative and productive that the running joke is that he’s going to have to get some sleep one of these years. And Anne-Julie and Jane, who’re bringing marketing skills to bear on the problem. This trip I also got to spend time with Zbigniew Braniecki (aka Gandalf), who’s a member (among many, many others, as he’ll attest) in our Polish community and is inspiring to talk with about any subject. Anyway, last week reminded me yet again of how many people there are around the world who care incredibly deeply about keeping the web open — not just in Europe or Mountain View, but everywhere. Thanks to everyone for a great week. I’d been meaning to read this graphic biography for some time now — finally picked it up yesterday and am really glad that I did, as it’s fantastic. It’s the story of a girl who’s about my age — born in 1969, I guess — who lived in Iran through the Islamic Revolution before eventually moving away. In a way that’s deceptively simple, she illustrates and illuminates some of what it must be like to see one set of personal political wishes get completely overtaken by someone else’s interests. She seems to really remember what it felt like to be a kid in that situation, and her writing is thought-provoking, to say the least. I also learned some history that I hadn’t known before. A very quick read — took a few hours — and highly recommended. Like Pyongyang,which I read a few years ago, the graphic novel quality of this memoir gives it a life and immediacy that’s wonderful, even if (or maybe because) the subject matter is so tragic. Another incredible TedTalk — this one by Ben Dunlap, President of Wofford College in South Carolina. Amazing story teller, amazing story, and brilliant conclusion. Reminds us of how great we can be. I’ve watched it twice now; will no doubt watch it again. Amazing. 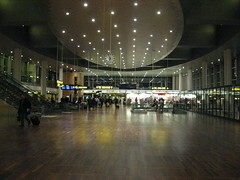 It’s an amazingly comfortable airport, and I found myself in a very good mood even with the very early departure time. 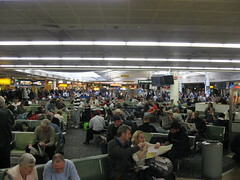 Heathrow is like the purgatory of air travel. Always delayed in and out, always crummy food, always long walks. I give the airport a little bit of credit, being one of the world’s very busiest airports, but man. Yuck. But I’m getting pretty familiar with the tiny-little-cans of diet coke in the red carpet club. both are great writeups that are well worth a few minutes.